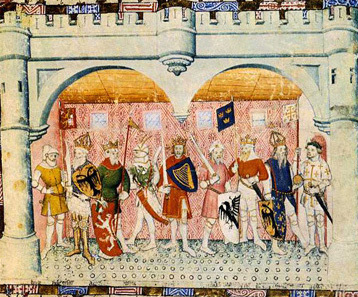 "In Piedmont, the Sala Baronale of the Castello della Manta with its frescoes (c1420) by Giacomo Jaquerio** depicting the Nine Worthis and the Fountain of Youth is an important example of late medieval Gothic wall decoration"
The Nine Worthies, illustration from Thomas of Saluzzos' Knights Errant, 15th c.
"A man of great culture, Thomas was the author of one of the most important chivalry texts of the Middle Ages, Le Chevalier Errant, written probably during his imprisonment in Piedmont. The text, written in French, is an allegory of the chevalleresque ideals. It inspired the famous frescoes in the Castello della Manta." His Daughter, Ricciardia of Saluzzo, married Niccolò III d'Este. Sigismondo (1433 – 1507), lord of San Martino in Rio. 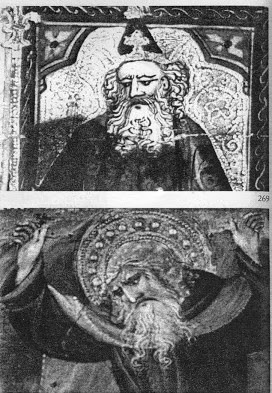 ** The Frescos in Fenis & Manta have more recently assigined by some to a different artist who worked concurrently with G. Jaquerio and for the same prestigious clients, Aimone Dux of Pavia _ "Aimo Dux (often Italianised as Aimone Duce) was a painter and miniaturist trained in the castle of the Viscontis at Pavia and in the Savoy area from the second decade of the 15th century." Seeing as the heads are at different angles it is hard to compare them exactly -- both long/narrow? What? What is so distinctive do you find about the horse's head? Is it not that dissimilar for example to this one? Yes, primarily the narrowness, like the head of a lizard. The white horse in Piedmont approaches that narrowness, but it is a side view rather than straight on or perpendicular to the picture plane. Added later: On the hand, the horse's head on the card is really badly drawn, I must admit, with the eyes at the very back, as though it were a bird with its beak. And the thick neck like a camel put below it, very awkwardly. On the other hand, the knight is nicely done, and much like dal Ponte's young man. It is as though the artist had a model for the man but not the horse. I find almost no attempt to draw a horse that way then. Even Leonardo had trouble getting it (https://s-media-cache-ak0.pinimg.com/56 ... 88f278.jpg). Looking at photos of rearing horses, I'd say it may be an impossible position for a horse. Maybe horses weren't his specialty. Also, he had assistants and a partner. 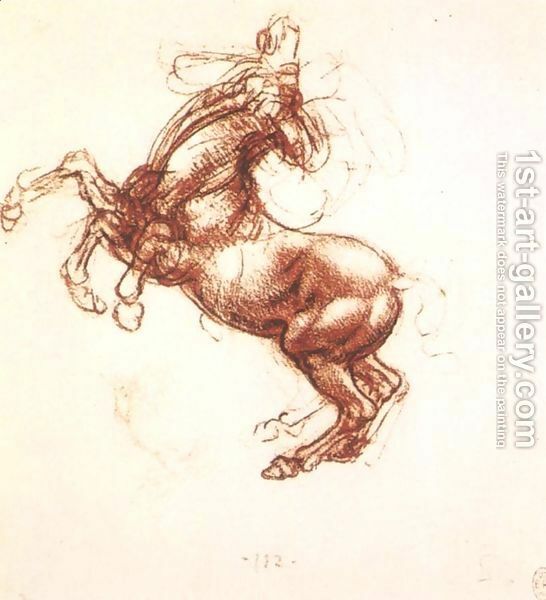 But the rider looks much like the dal Ponte drawing that Bellosi also compared the card to. What maybe is relevant about their "similarity" is the lack of a suit sign for the Rothschild Emperor. For "VIII Emperors" we would expect an Emperor and Empress for each suit. However it might be that the gold ball is the suit sign for coins. It is much like the gold circle held by the Page of Coins. There is also a scepter. But that does not look the same as the suit sign for Batons. Still, we might wonder what an Emperor of Batons would look like--a scepter held in his right and a lance in his left? That would look odd, but possible. (Added later: or maybe it would be like the King of Swords that Huck posts at viewtopic.php?f=11&t=345&start=360#p19003, with imperial crown and globe but also the suit sign in the other hand, for every suit except coins.) Still, the similarity does suggest, to some extent, a tarocchi. Then there is the question of if it is "too early" to be a tarocchi. There are two considerations: what is "too early" for a tarocchi, and what is "too late" stylistically for the dal Ponte workshop. La decorazione delle cappella Ficozzi (poi Umbardi) in Santa Trinita a Firenze, dedicata a san Pietro, fu eseguita tra il 1429 e il 1432. infatti commissionata il 6 marzo 1429 a Giovanni dal Ponte e al suo socio Smeraldo di Giovanni; i 13 giugno 1432 si sollecitano i due pittori a terminare il lavore, entro il mese successivo, motivo per cui è lecito supporre che si fosse ormai prossimi al termine del lavoro (cfr. Appendice documentaria, docc. IX, XIII). This looks like an extension of the work deadline to July, with no advance payment. In addition: the drawing of the two young men (https://3.bp.blogspot.com/-Lo7E67sO8cU/ ... i266-7.JPG) is in the editors' estimate, "1425-1430". The men with the elongated hat (https://3.bp.blogspot.com/-Plh6vr3m4E0/ ... 42det1.jpg) are "c. 1430". 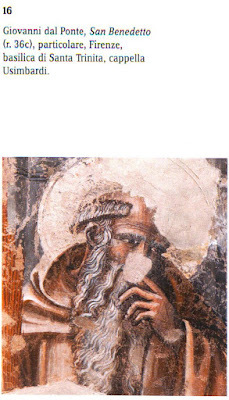 The predella with St. Anthony Abbot, so similar to the Emperor in the face (https://2.bp.blogspot.com/-vdsATkVbXqo/ ... -72det.jpg), is "1425-1530". 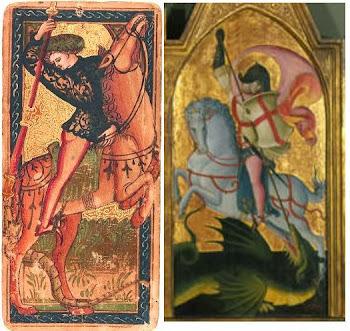 In allegorical art, the only paintings of the workshop similar in subjects to the tarocchi are the 7 virtues and 7 liberal arts, which are dated "1430-1435". So it is possible by stylistic and subject considerations to make the date of the cards, if by the dal Ponte workshop, extend to 1430-1435. What is "too early" to be a tarocchi? The Catania paper has the dates 1427 and 1428 in the filler for two of the cards. DDD in 1996 said the tarocchi could be as early as 1410. Prince Fibbia died in 1419. The Marziano is 1418-1425, and Marziano was succeeded in his position by the father of a man who published a lengthy commentary on Petrarch's Trionfi. There are considerations that suggests the 1428 marriage for the CY-type, if there was one (the banner on the tent, which could be Savoy, as the alternation of banners suggests among other things the union of two houses; also, Filippo finishing an illuminated manuscript of his father's, by a young painter who could easily have been prevailed upon to do cards). Surely 1430 is not too early in Florence, for an elite stratum of the population, and perhaps not including all 22 of the cards but only 14 or 16. Added later: please note that I have added some thoughts at the beginning of this post. Added: I would be nice to know, when Giovanni dal Ponte had been in Rome. Alfonso arranged mid 1423 a "peaceful" Trionfo (intended to celebrate the political unity between him and Jeanne II of Naples; a good opportunity for a triumphal deck), which became then reason for a new war 2 weeks later. Jeanne II, soon later, declared Louis of Anjou to her heir instead. 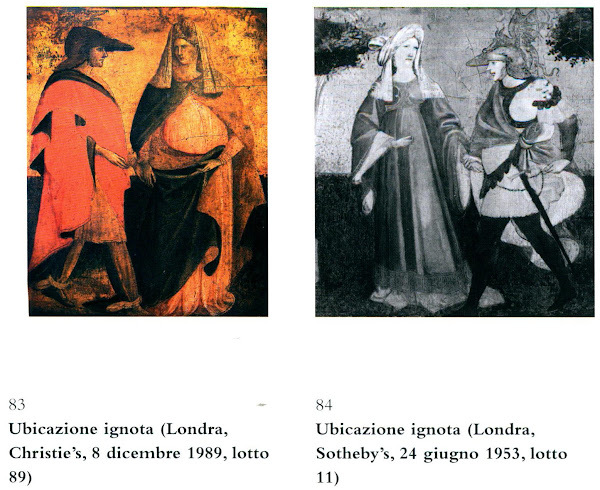 Dal Ponte was definitely in Florence in 1423, at least in March, since his delivery of (or contract for?) of a pair of cassoni is documented for that time (25 March, 1422 in Florentine reckoning) (Nov. 2016 catalog p. 227). It is that occasion that Fiorini picks as one likely to also have the cards. That dal Ponte was in Florence does not preclude Alfonso's ordering a deck of cards on the same theme, with dal Ponte being recommended to him by someone. Before 1423, the next earlier Florentine documentation is in 1418, then 1411 and 1410, (1417. 1411, 1409 Florentine reckoning) (Nov. 2016 Catalog p. 226); after 1423, there is nothing until the 1427 Catasto, which has quite an accumulation of creditors and debtors. However the documentation compilation seems to have left out his 6 month imprisonment in 1424 for non-payment of debts (due to his creditors not paying him). In Florence for celebratory occasions such as weddings, there remains the problem--at least it might be a problem--that card playing was illegal, and also there is no trace of cards being given on such occasions. When were the exceptions added? I seem to remember 1437, and in 1433 those exceptions were still prohibited (unfortunately naibi.net seems to be down at the moment). Neither imperatori nor trionfi were excepted--trionfi not until 1450, and imperatori never mentioned in Florentine statutes at all. However imperatori and trionfi would have been the same type of game as the excepted ones. Still, it detracts from the celebration of virtu and pudicitia appropriate to a wedding to make a show of something to be used for a game that is technically illegal. In the courts of nobles, however, card games seem to have been legal and so appropriate for display. So Alfonso in 1423 makes sense, and also Ferrara 1423, 1434, and other years. It does seem to have been legal in Florence to make goods for export, for example, clothes that violated the sumptuary laws and the deck for Malatesta. I don't know how much of a consideration this is. It might also be a consideration in evaluating the absence of payment or contract documents in Florence. Illegal transactions are best not kept in the permanent records. So they only show up in the inventories of deceased card makers and second-hand reports. People reading this thread should also be aware of the Ser Ristero thread, in case that hasn't been mentioned, for example Ristero's connection with Aragon, 1431, at viewtopic.php?f=11&t=1163&start=10#p18996. Please note that I have one more addition to my post at viewtopic.php?f=11&t=1005&start=80#p19001 (this one about what Emperors would like in various suits), thanks to Huck's post at viewtopic.php?f=11&t=345&start=360#p19003. Thanks. Margaret of Durazzo (Italian: Margherita di Durazzo 28 July 1347 – 6 August 1412) was Queen of Naples and Hungary and Princess of Achaea as the spouse of Charles III of Naples, and later regent of Naples during the minority of her son. She was the fourth daughter of Charles, Duke of Durazzo (1323–1348) and Maria of Calabria, but the only one to have children; her legitimate line of descent, as well as the century-old Capetian House of Anjou, ended with her daughter. Joanna was born at Zara, Dalmatia (present-day Zadar, Croatia) on 25 June 1373, as the daughter of Charles III of Naples and Margaret of Durazzo. In 1414, she succeeded her brother Ladislaus to the throne of Naples; at that date she was 41 years old and was already the widow of her cousin Hedwig's rejected fiancé, William, Duke of Austria. She married twice, but had no children. Joanna married her first husband, William, Duke of Austria in Vienna in the autumn of 1401 when she was 28 years of age. He had been rejected as a husband by her cousin, Hedwig of Poland. Joanna did not have any children by William, who died in 1406 after five years of marriage. It was sometime after his death, that she acquired a lover by the name of Pandolfello Alopo, whom she appointed Grand Chamberlain. Alopo was the first in what would become a series of lovers and male favourites. He later caused the downfall of the influential condottiero and grand constable Muzio Sforza, provoking much jealousy. In early 1415, she became fiancee to John of Aragon, a son of King Ferdinand I of Aragon, and twenty-five years her junior. The betrothal was annulled shortly after, which left Joanna free to choose another husband. On 10 August 1415, she married a second time, to James of Bourbon, Count of La Marche, in order to gain the support of the French monarchy. The marriage contract stipulated that upon his marriage to Joanna, James would be granted the title of Prince of Taranto. Not having received the promised title, he had Alopo killed and forced Joanna to name him King of Naples. In an attempt to assume complete power, James imprisoned Joanna in her own apartments in the royal palace; however, she was later released by the nobles. In 1416, a riot exploded in Naples, and James was compelled to send back his French administrators, and to renounce his title. In this period, Joanna began her relationship with Sergianni Caracciolo, who later acquired an overwhelming degree of power over the court. On 28 August 1417, she reconquered Rome, and the following year (1418), James left Naples for France. With James now powerless, Joanna could finally celebrate her coronation on 28 October 1419, when she was crowned Queen of Sicily and Naples. However, her relationship with Naples' nominal feudal suzerain, Pope Martin V, soon worsened. Upon the advice of Caracciolo, she denied Martin economic aid to rebuild the papal army. In response, the Pope called in Louis III of Anjou, son of the rival of King Ladislaus and himself still a pretender to the Neapolitan throne. In 1420, Louis invaded Campania, but the Pope, trying to gain personal advantage from the menace posed to Joanna, called the ambassadors of the two parties to Florence. Joanna rejected the ambiguous papal proposal calling for help from the brother of her erstwhile betrothed, the powerful King Alfonso V of Aragon, to whom she promised the hereditary title to Naples. Alfonso entered Naples in July 1421. Louis lost the support of the Pope, but at the same time the relationship between Joanna and Alfonso worsened. In May 1423, Alfonso had Caracciolo arrested and besieged Joanna's residence, the Castel Capuano. An agreement was obtained; Sergianni was freed, and fled to Aversa with Joanna. Here she met again with Louis, declared her adoption of Alfonso to be null and void, and named Louis as her new heir. Alfonso was forced to return to Spain, so that she could be returned to Naples in April 1424. Sergianni's exceeding ambition pushed Joanna to plot his assassination in 1432. On 19 August 1432, Sergianni Caracciolo was stabbed in his room in Castel Capuano. He was buried in Naples in the church of San Giovanni a Carbonara. The remaining years of Joanna's reign were relatively peaceful. Louis dwelled in his fiefdom, the Duchy of Calabria, waiting for the call to the throne, but died in 1434. The aging Joanna named René, Louis' brother, as her heir. She died in Naples on 2 February 1435 at the age of 61, and was buried in the Church of Santa Annunziata. With her death the entire Capetian House of Anjou became extinct. It's definitely clear, that the Durazzo family had the Rothschild cards in 18th century. Eitelberger noted around 1860, that some playing cards had been once in the possession of Leopoldo Cicognara, but this might be easily a wrong information. Or the sentence was possibly related to another playing card deck. A "moorish relation" from Jeanne II we get with the adoption of Alfonso of Aragon (1421 ?) ... or already from her fiancee, John of Aragon (1415). 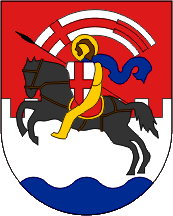 That's the (modern) city heraldry of Zadar = Zama in Dalmatia. The city is relative far to the South at the Balkan. Jeanne II was born there. The saint George cross is there (I suggest). From earlier researches I remember, that Alfonso of Aragon searched for influence also in this region. Collector, and adviser to Albert of Sachsen-Teschen; born in Genoa. Austrian ambassador to Venice, 1764-84. The collection included books as well as prints, and continued to be added to after his death. It seems that many of the records of acquisition are preserved in the family in Genoa, and that the sources were international (see Petrucciani). The print collection was sold by Gutekunst in Stuttgart in two parts, on 19 November 1872 and 20 May 1873 (for the BM's acquisitions see 1873,0809.613 to 969). The BM had previously tried and failed to buy the whole collection (see Carpenter's report dated 5 April 1848). It had first been offered to the BM in 1826 for £14,000: see J T Smith's report dated 10 May 1826 in which he recommended against accepting the offer. See Bartolommeo Benincasa, 'Descrizione della Raccolta di Stampe di S.E. Il Sig.Conte Jacopo Durazzo, Patrizio Genovese ec.ec. esposta in una dissertazione sull'arte dell'intaglia a stampa', Parma, 1784. (In P&D library). For a history of the collections of the Durazzo family, see Luca Leoncini (ed), 'Da Tintoretto a Rubens: Capolavori della Collezione Durazzo', exh cat, Genoa, Palazzo Reale, 2004, and the 2012 exhibition in the same venue by the same author. From the moment of his accession, Alfonso continued the traditional Aragonese policy of Mediterranean expansion. Thus, in 1420 he set out with a fleet to pacify Sardinia and Sicily and to attack the Genoese possession of Corsica. The queen of Naples, Joan II, then sought his help against Louis III of Anjou and adopted him as her son and heir. Alfonso was received as a liberator in Naples on July 5, 1421; but the volatile character of the Queen, who soon afterward began to make overtures to Louis of Anjou, obliged Alfonso in 1423 to return to Catalonia to seek reinforcements. So you are exploring the hypothesis that Alfonso gave the cards to Joan/Jeanne, perhaps as part of the festivities of 1423, and then after Jeanne's death the cards went to her mother's family, which would explain how they were in that family's possession in the 18th century. It's a long shot but worthy of consideration. How would Alfonso have commissioned the cards, which still seem Florentine (and I still think the dal Ponte workshop)? Through commercial contacts between Aragon, or Sicily, and Tuscany? Through Ferrara? Through contacts in Florence (which at that time, until his alliance with Visconti, might have been neutral to him.) I do not see how they could be Aragonese cards, but what do I know? Also, I would like a link to something detailing Alfonso's festivities of 1423, which I presume happened before relations soured between him and Jeanne. SteveM wrote: Well, yes -- but it is very far from clear that they had been in the family since the 15th! Although it would be nice indeed to see some affirmation of a Naples/Aragon connection -- as a collector of Books and Prints, more likely that Giacomo Durazzo purchased them for his collection? As I wrote, Eitelberger seems to have indicated, that he believed, that Leopold Cicognara sold cards to the Durrazo family, other parts to Turin and another part to the Vienna family. But from the Vienna cards he gave another size than that of the Rothschild cards ... either the Durazzo family had also other playing cards or Eitelberger was confused or any other explanation would be necessary. Also Durazzo might have been motivated to buy the cards, cause he had the idea, that they were from an earlier context to his family. Nonetheless it's curious, that we find for stylistic reasons (moorish shield) and from another context (Ser Ristoro cards at the time of the death of Jeanne II) to a similar situation (Alfonso/Spain).